You must be a member of the Turin Excursions & Fun Group to attend this activity. Would you like to join this group? 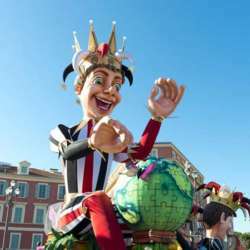 The journey leads to Nice, capital of the Côte d'Azur, which during Carnival comes alive with colorful masks, cheerful music, colorful parades and flower battles that make the atmosphere even more sparkling and effervescent. The beating heart of the Carnival is the suggestive Promenade des Anglais, the seafront of the city, where you can attend the sumptuous 'Bataille de Fleurs' a parade of elegant allegorical floats completely decorated with beautiful floral arrangements and charming characters, the 'mannequin', dressed with bizarre costumes that launch a myriad of colorful flowers to the festive spectators. Fee does not include: lunch and personal extras. Accessible path. Not allowed small animals, sorry!